Our quaint beachfront units are directly on the beach, with no roads between the rental and the ocean! There are 5 units in the complex, and they all share a semi-private beach area. This unit has just been completely remodeled, with new kitchen counters, appliances, new bathrooms, and new furniture! It is an upper level unit (with no one above you), and has a huge private balcony spanning the west side of the unit, perfect for sitting out and enjoying the view! Each of the units has a full kitchen with all cookware and utensils, microwave, dishwasher, and stove. Wall unit AC. They also have WiFi, TV's, and dvd player. There is a coin operated shared laundry facility as well. Overflow parking is available at our office in Oceanside, located at 1640 Oceanside Blvd, Oceanside, CA 92054. These units are perfect for romantic getaways, a gathering with friends, or for a small family. And you'll love the location! 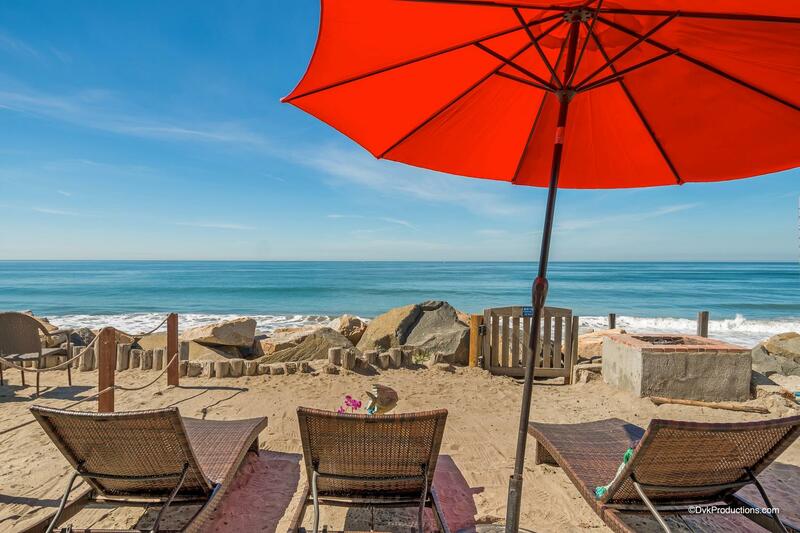 The coastal town of Oceanside boasts wide, sandy beaches and beautiful weather all year long. There’s no shortage of activities for play or relaxation. After a day in the sun, take a stroll to the Oceanside Pier, the longest wooden pier on the western U.S. coastline. Take in the views, watch the surfers or drop a line and go fishing. Or, consider taking a sailboat out on the harbor at sunset. You will not find a better deal on a beachfront vacation rental! Perhaps grab a bite to eat at one Oceanside's local restaurants like The Wrench & Rodent Seabasstropub. The condo was clean and with the exception of one thing the photos accurately represented the property. The photo of the bathroom vanity area is accurate however the commode and shower have not been renovated. I am very tall and have problems with my knees, the commode was so short that it was very difficult to use. I did anticipate this issue and brought an extender for the commode however it did not fit. The weather was cold and rainy for the entire 5 days which meant that we were inside most of the time, there is only one TV in the condo, it would be nice to have a second one in the master bedroom to allow at least two people to watch separate programs when the weather is not great. The double beds are bunk beds which is really not adequate for adults, there are two double beds mentioned in the description but no indication that they are bunk beds. We’ve stayed on this property for 3 years now. Love that it’s jistbdown the street from a park since we take our dogs every time. Unfortunately Bucaneer Park has become overrun with homeless people that are there 24/7 & it’s a little unnerving to take the dogs to the park in the dark by yourself with several homeless people hanging out & sleeping all around you. / : The showers also ran out of hot water every time we used them so we had to rush, rush to not get blasted with cold water. Besides that this vacation property was perfect for our family. No beach in front, just rocks and ocean. Had to drive to another beach to go into the water. Dear Terri, The City of Oceanside is getting more sand next year! Hope you come again, The Team at Beachfront Only! The property is very good. House was a great location! Views were fantastic and the waves lulled you to sleep every night! Having the firepit on the balcony was a great way to end a wonderful day! Very comfortable and convenient condo right on the beach. Love the fact our kids could play on the beach as we watched from our balcony...lots of other kids in the condo. Liked Bucaneer Park within walking distance. The only negative experience was all the construction going on next door! Had to listen to jack hammers and concrete saws, and battle parking space/traffic around a "Bobcat" and other work trucks. Parking spots were tight in the carport. All the construction workers were nice though! Condo and grounds could have been child-proofed a little better though (our balcony had a large spot where our little one could've fallen through...covered it with some kind of mesh..had to move the BBQ to block it). Had to move chemicals from under the sink as the child "Locks" were broken on the cupboard door. I enjoy working with individual renters versus a management company, but For the most part, it was a pleasant experience overall. The accommodations were comfortable and the location is great. What impressed me most was the above and beyond customer service we received from Diana. She and her maintenance team are simply amazing. Very friendly and willing to go the extra mile to ensure guests have the best experience possible. Very quick response time for any service calls and all items were quick and easy fixes. We would definitely book with Beachfront Only again due to our positive experience. I wanted a location with beach access and to hear the ebb and flow of the waves all throughout the night. This was exactly that. Everything was clean and neat. We booked our trip super last minute for spring break. Everything about it was seamless and easy. Perfect trip with the kids for a few days. Clean, stocked with all the essentials and have your own little beach. We will return for sure. Traveling with little kids can be hard staying in hotels but having our own little apartment with kitchen makes it much more relaxing for mom and dad. Views are amazing, listened to waves all night and close to everything. Thanks again. This was our first time staying at this location and it was worth it! The views (even from the master bedroom) were breathtaking. Having the private balcony to ourselves made it seem like the only ones there. Would definitely stay at this property again. For sure will not be our last beachfront stay. Already planning future trip with the family. Great location. Everything you'll need is available at the unit. Overall, we had a wonderful time! The location is awesome but parking could be challenging. It was incredible to walk down stairs and be steps away from the beach. The pre-trip communication was clear and timely; the unit was clean and well equipped; the management was accessible and low key. Expensive but a great vacation spot! This is our second year and we are already planning next year. We had an amazing time staying here and we will definitely come back again! Could use a little more updating but besides that great place! Everything was as described. It's a great property and the ocean views are wonderful. This property was exactly as described. I chose it because I like the views and privacy of being upstairs. The deck is large and I brought my own reclining chairs. Very clean. I'll be back. Fantastic beach condo. Property was everything it appeared to be on website plus so much more. We can't say enough about this condo and the surrounding area. Will be back many times and already planning a return trip in a few months. Special shoutout to Patrick!! The pictures on the website for this unit are completely misleading. Even the main one showing the balcony. The front is covered with lattice cut slats that make it really difficult to see and enjoy the ocean if you're sitting out there. There was also another covering (small square netting/wire) over that of that as well, adding to the interference. The paint was all chipping, and there were a lot of rust stains showing on the wood. Overall, they've made many, many shortcuts in this unit where little additions would have made all the difference. There are a lot of notes on things (which can be helpful) but the worse one was on the fridge telling you not to change the temperature or there would 'be problems'. The temperature was set over 40 degrees (40 degrees is the 'safe zone' for food). Seems like just cost-cutting for the owner. There is a great bar separating the kitchen and the living room. But no bar stools on either side so you could utilize it. Parking. The spaces are super small/tight, and very close to each other, with poles separating each space. If two spaces are taken, you wouldn't be able to open your door. We had to park on the street the entire time. Which is fine, but you should be honest about it. The access to the beach was key for us. It's right there. Which was perfect. We've rented on BeachFrontOnly several times. This is the lowest quality place we've seen. We stayed here 4 nights in November and were delighted with the property. It was very clean and has recently been updated with new furniture. The location is great for a peaceful holiday by the ocean. We plan to return in future. The manager was friendly and helpful. Great place to relax and hang out. Great service. We had a fuse go out in the kitchen and the WiFi went out both were fixed within five minuets. The ocean view was amazing. Overall the experience was great. The access to the private beach coupled with the stunning views made the stay very positive. Space # 3 doesn't sleep 9 as reported. Unless you count two people sleeping in a full bed. The pull out couch was uncomfortable and the mattress could be updated. The app was very useful and the door codes being preprogrammed was very simple and convenient. The balcony was an amazing place to visit and enjoy the ocean views. While #3 had the balcony it was a little confusing knowing that space #1 had a majority section of the communal area. This could be explained better while booking. The lack of a washer and dryer in the unit was disappointing, again the advertisement made it sound like one was provided in the unit. Not communal and cost money to use. Better clarification. THis place was perfect for our family of 5. The condo is so comfortable and clean and the deck was incredible. We sat on the deck for hours! We were there for three nights but wished we were there for a week. We will be back for sure. Already looking for dates. We stayed last week (July) and it was perfect for our girls getaway. Unit says it sleeps 9 but we think that would be good if you have a few kids in the mix. We were 6 adult women and it was perfect. Endless ocean views from the couch, kitchen, bedroom and balcony was unbelievable!!!! It was clean and the management running the property were wonderful to work with. Beach is right there, but like most of that area, very rocky. Kitchen was well stocked with supplies to cook in. I would stay here again! Location is part of the heaven. All property clean made me feel great treat for me. We absolutely loved this place! Perfect location! We have stayed at numerous places and this is definitely one of our favorites. My only suggestion for these beach house/condos is to supply a crock pot. We would be gone all day & would have loved to throw dinner in before we left to have it ready when we came back. Other than that, it was the perfect trip & would definitely book again!!! Interesting unit, in good condition, beach good for strolling except for highest tide. Rental company responsive to any issues. Unit modestly but sufficiently appointed, a bit expensive but a great place to relax by the sea. Nice size rooms, updated kitchen, very large patio with amazing ocean views. Quite neighborhood. Very clean. Beds were very comfortable. Great customer service from property managers, who helped us with a package pickup. Cons: couches were uncomfortable, deck chairs were uncomfortable. Bathrooms need complete remodel. No restaurants within walking distance. Car is a necessity if you stay here. Home Feel and everything you Need!!!!! Loved it from the time we walked in. Home feel - just like being at home, the only difference is having an Awesome ocean view, smell and sound!!! We we're able to cook and barbecue out on the beautiful deck and the family loved the walks kn the beach everyday. Would highly recommend to family and friends and within hesitate to come back again. Truly A gem and the price was very reasonable this family at six and our 3 little dogs. This is our 2nd time staying in this unit--wonderful location and excellent condition of the residence. We plan on coming back in 2016 and have more family join us thus we will want 2 or 3 units at that time. I'm a bit OCD about cleanliness and this house did not disappoint! Everything was in perfect condition. We really liked the modern, delux appliances. Having a complete kitchen made our stay that much more enjoyable. We loved using the grill on the deck. The beach was so nice and not crowded at all. In the mornings we enjoyed watching the surfers, dolphins, and even saw a whale! A few minutes drive and you'll be at the pier and harbor or if you drive south you'll be in Carlsbad. It's a great location! Could have stayed a month! The apartment was perfect. Very well thought out. Perfect location for the beach. The deck as just as described. My only complaint is the check-in and check-out time. For the fee, it seems that you could make check out an hour later and check in an hour earlier. Otherwise, it was perfect. Great property. We enjoyed our stay. It is expensive but if you want to be right on the ocean then this is a great spot! All my questions were answered and when we arrived, we were well prepared. The condo is just gorgeous. The beds were so comfortable, the kitchen was stocked will all the dishes and cooking tools needed. Everything was clean and tidy. We were with our 7 year old daughter, and they even had sand toys for kids on the property. The views were amazing! We can't wait to come back! My family really enjoyed the location of this condo, right on the beach! We had views of the beach and ocean from the living and dining room, kitchen, and one of the bedrooms. The condo was equipped with everything to allow us to cook breakfast and dinner easily, and we appreciated the patio furniture, that's where we enjoyed our meals and morning coffee. My wife and I are a little on high strung side when it comes to things being clean and I must say we were surprised at how clean the condo was. It smelled clean, felt clean as apposed to grimy, the carpet was very clean and so was the furniture. It was stocked with cleaning supplies so that we could clean up when needed. The only thing I wish the unit had is a garbage disposal. We stayers for 4 nights and we were comfortable the moment we stepped in til the time we left. We booked a sailing excursion with Captain Steve Ford @ 760.207.5572. He was a great guide, friendly, professional and patient in showing our kids his boat, explaining the instruments, assisting them in taking the helm, etc. It was an excellent experience for our family and a memorable one for sure. I would highly recommend making a reservation with him if you want to go sailing. The property was terrific, the reservation and check-in arrangements convenient, and the on-location staff very helpful. I was so glad to have local people available to attend to our needs immediately and efficiently while we were there. The cost was high but the stay was delightful. A fun and relaxing stay! It was my two kids 5and 6 my wife and I. We had an awesome time. Great views from the private balcony and right on the beach, no walking to the beach just walk down stairs and you are there. Great location. We thoroughly enjoyed our stay in Oceanside. Our unit was spotless, modern, and completely equipped with everything we needed. The rental process was very efficient and pleasant. Our dog sitter cancelled at the last minute and I contacted them two days before our arrival. I was able to add the dog easily and Diana was very pleasant and helpful. They communicated with us at every step and were clear about arrival and departure codes. Celebrating my mother's birthday. Great beach home, had all amenities like home with a breathtaking view! !We will be back for a longer stay. From the first point of contact to the end of our special days on this gorgeous stretch of beach, we were more than pleased. We will be back! The location was fabulous, the rental was perfect, beautifully decorated, clean, very comfortable... I would surely stay again...=D. View from balcony of Condo is spectacular. Beach area narrow and limited but interesting. Unit was very clean, modern kitchen with quality appliances, comfortable bedrooms, bathrooms dated, 1950's. Location is convenient to most needs. Great 2 bedroom 2 bath with large deck with views from dining room, kitchen and bedroom. Very clean and comfortable. Our dog loved to sit on the deck and relax with us. Private section on backyard beach access and good amenities. Only 2.5 spots in car port, so we parked on street which had adequate availability. Neighborhood was quiet at night since its moderately far from the pier. We would come back again. We had a nice vacation. The location was great, close enough to walk to the pier but far enough away that we had more privacy on the beach. I did think it was a bit pricey but would consider staying here again. The location of this condo was perfect! The condo itself needed some attention. It was very clean, however the screen doors were broken, the folding door on one of the bathrooms was broken so it couldn't be used, and the shower door in the other bathroom wouldn't close all the way. I understand that it's the end of the season, but we expected it to be in better shape. One thing that was not a maintenance issue, but was difficult, was that the toilets were so close to the walls that you had to sit sideways on them. Also, the parking was very unclear. We ended up getting a $51 ticket for parking in front of the garage. The other option was to tandem park behind another guest. I would suggest just parking on the street if possible. We enjoyed most everything about our stay here! The apartment was just like we expected, the layout was very nice and the furnishings comfortable. We loved the comfort of the king size bed and being able to see the ocean first thing every morning when we awakened. The few "glitches" we ran into were handled very quickly by the management team and we could not have asked for faster or more professional service or resolutions. We were actually closer to the waves than we thought from the pictures and getting down to walk on the beach was really easy and convenient. The best for us though was simply sitting on the deck and watching the water for whales, dolphins and surfers - paradise indeed! We hope to return many times in the future! My friend and I stayed here for 4 nights. We were pleasantly surprised that the condo was exactly as depicted in the photos. Everything was clean and well maintained. The view from the private deck is beautiful. We are talking about coming back with our families next year. Great location, beautiful weather, and very relaxing. Only complaint would be the uncomfortable futon, and no chaise lounge on the deck. In town visiting our kids. Great place to meet and enjoy the sand and ocean and for meals and drinks on a very large deck. We had an amazing family vacation here! The unit was clean and updated and very well stocked. The beach was quiet and clean and we enjoyed hours of fun in the ocean. The balcony is private and overlooked the beach which was amazing for watching the sunset. The only negatives I found were the proximity to the train which can be pretty loud throughout the night when you want to keep the window open and the pullout couch is really just an uncomfortable futon that should probably be replaced with a real couch. We will definitely stay here again next time we visit Oceanside! Celebrated our 20th wedding anniversary. Loved every minute. Even though the weather was not the greatest the apartment had all we could have wished for. Cool mornings with a bit of rain but by 1pm or so sky's cleared and we were able to enjoy all of the local activities. Completely stocked kitchen with all your cooking tools. We BBQ'd and had Bon fires 2 nights. These folks really pay attention to detail. I didn't want to leave. We will be back. MY FAMILY AND I HAD A GREAT TIME. IT WAS VERY RELAXING AND THE LOCATION WAS GREAT. THE PIER WAS A LITTLE FURTHER THAN I EXPECTED, BUT WAS GREAT. THE CONDO IT SELF WAS VERY NICE AND EVEN BIGGER THAN THE PICTURE HAD SHOWN. THE NEIGHBORS WERE VERY FRIENDLY. I WOULD LOVE TO STAY AGAIN. MY FAMILY LOVED OUR STAY AT THE CONDO EVEN BETTER THAN DISNEYLAND. The lady in unit 1 did not keep her dog on a leash and it would bark annoyingly at people as they passed by and once chased me up the stairs. I would have kicked it if it bit me and so our stay there put my family at risk. The area designated for Unit 1 was disproportionately sanctioned off for the lady in Unit 1 and I believe was not disclosed that we would have an area that was not available to us to use/share with other guests. We would not come back. I felt uncomfortable with her there taking up more than her fair share of space. Unit 2 and Unit 4 folks were very nice. Photos taken of the unit were old and did not represent the disrepair of the unit. The sink in one of the bathrooms did not drain. This place was a dump, towels were obviously very old some outlets were broken. Total waste of money.. would have paid more for better quality. Excellent views, nice location. Could stand a little upgrade. Shower stall leaked a little bit. Bed sheets were not soft, maybe new sheets. Some fresh paint. Otherwise nice place. Questions were answered promptly. Would stay rhere again. The property was everything we expected and more. Check in & check out was beyond easy. We were given all the information needed and was easy to access. The property was spotless clean with all the amenities described. We loved the location. It was so convenient for the 4 of us and our 2 dogs. There is a park close by for lots of walks. The large patio was heavenly. It offered lots of room and privacy with the amazing ocean right in front of us. Although there are lots of shops & eateries close by.. we never left. We are looking forward to booking our next trip. My girlfriend and I had so much fun here it's hard to describe . The place was supper clean and quiet with nothing but the sound of the Pacific Ocean. if your a surfer this is the spot. Endless sunsets and ocean spray best describes this beautiful place. We contacted Beachfront Only at the last minute and they gave us options for the week we were looking to book. We went withe P5161-3 and it was everything they promised. We had a fantastic time and spent alot of time on the out dorr patio just looking and listening to the ocean.We will definetly be coming back soon! Also we loved the app for my iphone and the customer service was fantastic! We love staying in Oceanside and this stay was spontaneous due to some work on our San Diego home. The location was great and we enjoyed our panoramic views of the ocean. The carpets were new, paint was newly done and the stainless steel appliances were very nice. But, I could not overcome the mini roaches (I am sure the big ones were better at hiding) that were in the kitchen and bathrooms. I would not stay here again. As you graciously mentioned, we did just completely update this home in October. It is a beautiful home with an amazing view. We have received a lot of great feedback from our guests, and hope that you will consider joining us again in the future. We certainly were concerned about your comments about the insects, and addressed the issue immediately after we received the information. Towels as the bath towels never dry completely. Other than that, everything else was fine.